One of my favorite tools for my essential oils is a pierce of jewelry that acts as a diffuser! These little gems allow you to get the benefit of your oils all day with out having to pull out your essential oil bottle! When you are wearing a diffuser on your wrist or around your neck you are able to benefit from Aroma Therapy at work, at school, or when you are running errands. How do you get your hands on these oils? You can buy them retail through Young Living or you can purchase a starter kit, which makes you a wholesale member, and buy them at wholesale prices. The oils in the starter kit are amazing and you will need them for many other things (especially if you have kids)! 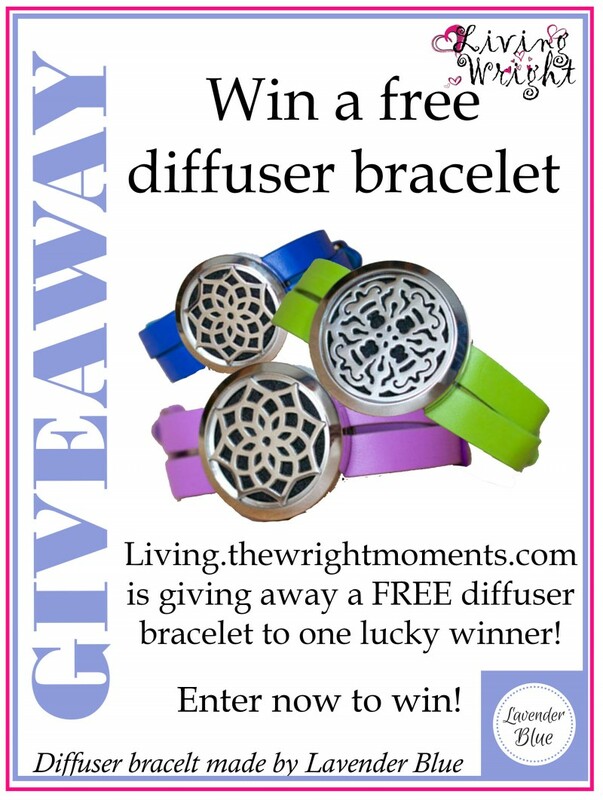 Enter for a chance to win a FREE essential oil diffuser bracelet! The essential oil diffuser bracelets allow you to have the benefits of essential oils on your wrist all day. Just put a few drops of your favorite essential oil on the leather inside your diffuser bracelet and enjoy it all day! Lavender Blue makes high quality jewelry that everyone can enjoy!